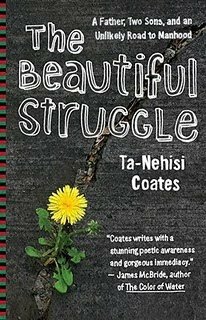 If we could read Coates's book alongside other major autobiographical works by black men, we'd see some cool overlapping patterns in terms of them describing how they all came to a certain kind of intellectual consciousness. You see it in Frederick Douglass's narrative. You see it in Richard Wright's autobiography. It's there in Malcolm. It's in Haki Madhubuti's autobiography. Yep, you see it in Obama's books. And here it is, there also, in Coates's The Beautiful Struggle. You read passages of all those men engaging various texts and getting a spark from those texts that, at least according to their accounts, is really important, transformational even. I was twelve, but when I heard 'Lyrics of Fury' - 'A horn if you want the style I possess / I bless the child, the earth, the gods, and bomb the rest' - I put away childish things, went to the notebook, and caged myself between the blue lines. In the evenings, that summer, I would close the door, lay across the bed, and put pen to pad. Later, he goes "I wrote every day that summer, rhymed over B-side instrumentals." He admits that his flow was "flicted and disjointed," and his words "were all braggadocious." However, "when done with the recital, even though I was alone, I felt bigger" (110). It's really fascinating to follow him writing about what rap music meant to his intellectual and emotional development as well as to his practices as a writer. Too often, I feel, we hear over-exaggerations about the goodness of rap only matched by the proclamations about its negativity. What I like about chapter 4 and the book in general relates to how it makes me think longer and harder about the things that might inspire, frighten, intrigue, and confuse young black men. That is to say I guess, the book might be giving me ideas for thinking about the young brothers that I work with at the university and in the community. But what about y'all? What stood out to you concerning chapter 4? What else should we be thinking about right now? Okay, so ch.4 is when we really get to see Coates as the seeker of the knowledge. I mean how cool is it that he knew Tupac and his sister, Sekwiya personally, but it doesn't take over the story (at least thus far). There's alot to be said of Afeni, but he sums it up with "Afeni was large." Then he goes into the moment when Sekwiya hears Chuck D on "Rebel Without A Pause" where he gave a shoutout to Assata Shakur (JoAnne Chesimard) p.106. The biggest thing I took away from this chapter however was the use of language/lyrics to excel the person...personification rather, so even if you're nothing like what you rap about or say, you still feel bigger ( I can't find the page, I'm rushing), but I also liked Dometi's comment how he quotes hiphop lyrics like Shakespeare and Hemingway - Black Studies could possibly construct an exhibit for the males in the fall (and friends of Black Studies) that would serve as a guide throughout the book "Re/constructing or Decoding Ta-Nehisi's Coates's Beautiful Struggle" because this book is going to introduce the "under-read" to a wealth of information. I feel like this book will be for some students, one of the introductory "Knowledge of Self" bookshelf books. It helps to have a visual or some type of memory. It's hard to imagine "On the cover, her face was off center. She wore an afro and glanced over her shoulder" if you've never seen the book or don't know who he's talking about....just my thoughts. Good ones Dometi, thanks. I actually think rappers are more than Twain and Shakespeare, when we consider the whole listening parts, the mix of technology, the ways that the guy in Coates's childhood used Rakim and others to feel bigger. Shakespeare "and them" couldn't get to it like that. ha. @ Symmetry. Yep. I love the idea about something visual. You know that's how we roll anyway. Beyond or in addition to an exhibit, we might figure out how to produce some kind of bibliographic map that shows people points along the journey to this "knowledge of self" we see in Coates books and with our own movements with black studies.